The versatile full back has played just 61 minutes for the Lilywhites this season having missed three months with a hamstring injury. The 31-year-old moves to the Bantams, currently second from bottom of League One, on a deal until the end of the season. Woods joined PNE from Huddersfield back in the summer 2014 and was part of the side promoted back to the Championship 12 months later, playing at left back in the play-off final win over Swindon at Wembley. He made 35 appearances in the 2015-16 season before missing the whole of the following campaign after tearing the cruciate and medial ligaments in his right knee in a pre-season friendly at Oldham. Woods returned to action in September 2017, playing 18 times last season. 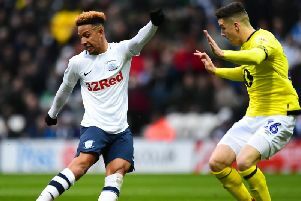 But he has been dogged by injury again this time around and will look to kickstart his career at Valley Parade after four-and-a-half years at Deepdale.